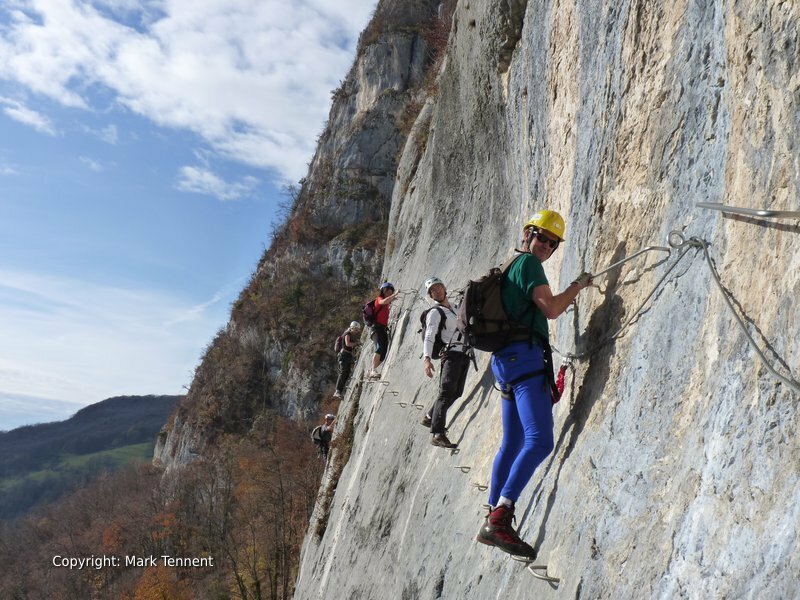 6 days guided via ferrata in the French Alps. Guided by Mark, over 30 years experience in the mountains. 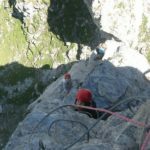 This guided via ferrata holiday is a great way for you to explore the delights of via ferrata in the French Alps. 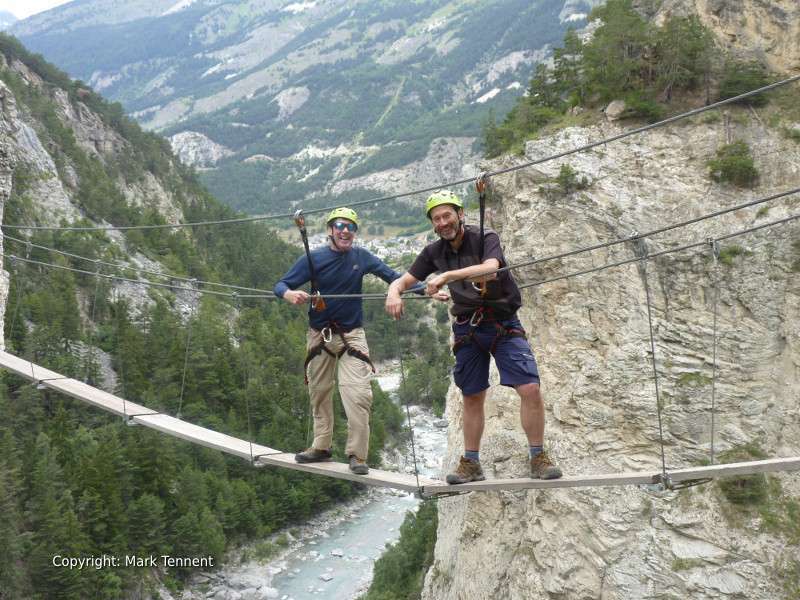 The via ferrata in France provide a fun, sporting activity. The fixed equipment, cables, anchors, etc is well-maintained and inspected. You will be immersed in the beauty and culture of the French Alps. Sparkling lakes reflecting the mountains. The sound of cowbells in the alpine meadows or the smells of pine resin wafting in the warm sunshine. Each days’ via ferrata will be chosen according to the weather and the most suitable via ferrata for you and the group (how are via ferrata graded)? 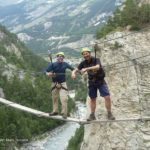 If the weather is suitable we will choose via ferrata higher in the mountains with great views of the peaks of the French Alps including Mont Blanc. Some routes can be accessed quickly from the nearest road whilst others may involve a short hike to the start of the route and a descent from the finish of the route. 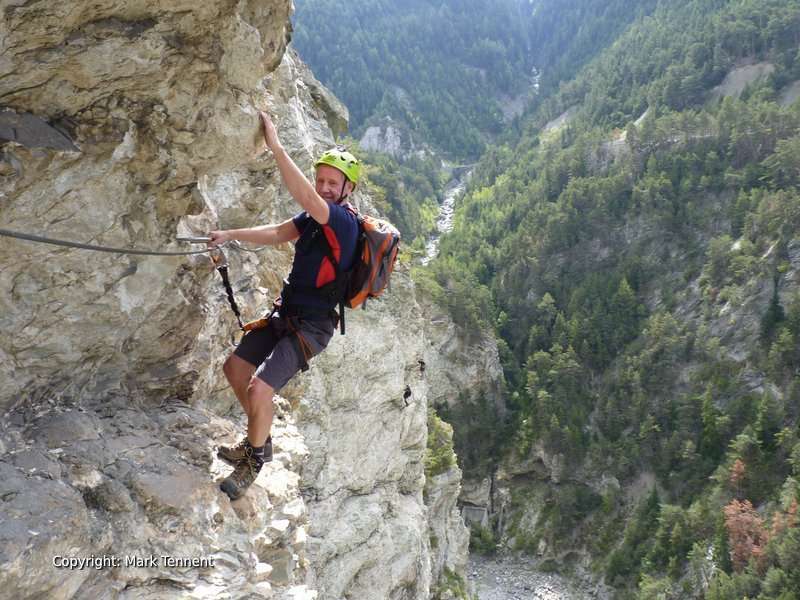 Based out of Albertville, in the heart of the French Alps, it gives you the opportunity to discover a range of via ferrata in the region. This is a perfect way to expand your horizons if you enjoy the outdoors and are looking for a challenge. There is no need for you to have previous via ferrata, or rock climbing, experience as you will be introduced in a gradual manner. Learn about via ferrata in my article “Discovering Via Ferrata – An Introduction”. Small groups, no more than 4, allow you to try out via ferrata under the watchful eye of Mark, your instructor. 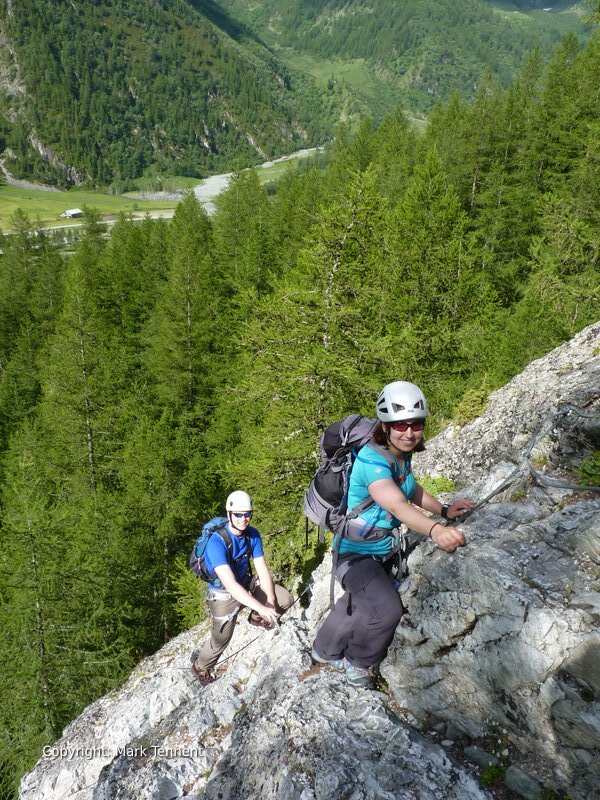 For those with no previous experience of via ferrata the first day will be carefully selected to give you an initial taste and to ensure that you learn to use the equipment in the right way. By keeping groups small your security and well-being is assured. 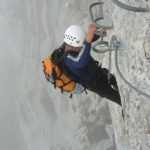 If you would prefer a via ferrata holiday just for you, your friends or family please Contact Mark. Below is a typical itinerary. Saturday – Arrival. Transfer from Geneva airport. The steep tower on the via ferrata the Roc du Vent in the Beaufortain. Sunday – Roc du Vent, Beaufortain. Mont Blanc and the turquoise waters of the Lac de Roselend are the picture postcard backdrops to this via ferrata. There’s something very satisfying in reaching a summit and lovers of the mountains will not be disappointed. An added point of interest during the descent is a tunnel cut through the mountain – best to have a torch! is in 3 sections. An easy intro’; a good warm up and then the spectacular bridge giving access to the grand finale. For those with arms still in working order there may be the opportunity to tackle a second via ferrata in the area. Enjoying the exposure high above the River Arc on the via ferrata Le Chemin de la Vierge. Tuesday – Aussois – stunning routes above the river Arc! A via ferrata fest! There are 7 sections with a range of difficulties. Routes include: La Montee au Ciel, Les Rois Mages, Les Diablotins, La Traversee des Anges. 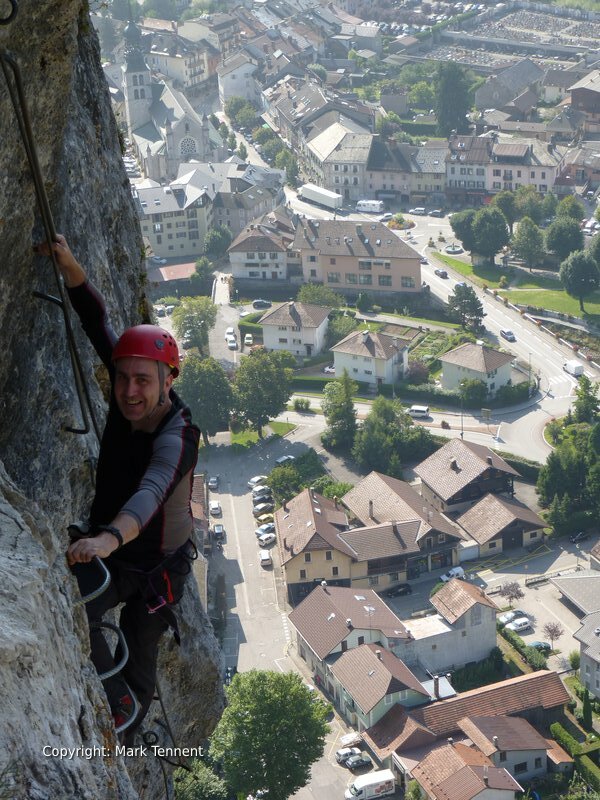 Wednesday – Aravis – overlooking the Col des Aravis there’s the via ferrata Yves Pollet-Villard. This via ferrata, in a spectacular position, gives tremendous views over the Aravis and the Beaufortain. 800m long with a total height gain of almost 600m. 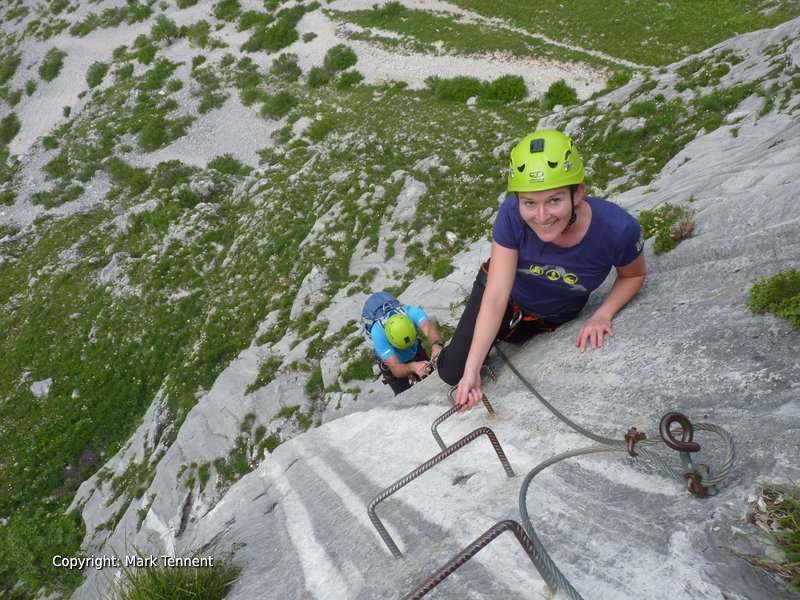 Friday – Thones – The Roc a l’Agathe is an absolute classic via ferrata. After a very short walk to the start of the route this via ferrata soon makes an impression. A series of steep sections brings you to a final large ledge. Here there’s a choice of finishes. Typically we will finish via a very exposed ladder which you climb facing out over the valley and Thones below. For those with the strength there may be the possibility of finishing over the overhanging finish; considered to be one of the hardest via ferrata in France. Saturday – Depart after breakfast. Please note: the final choice of via ferrata will be made on a daily basis. The choice takes into account weather and mountain conditions. The via ferrata chosen will be those best suited to the group. Min. / Max Group Size: 2 – 4 (for Private engagements please contact me). 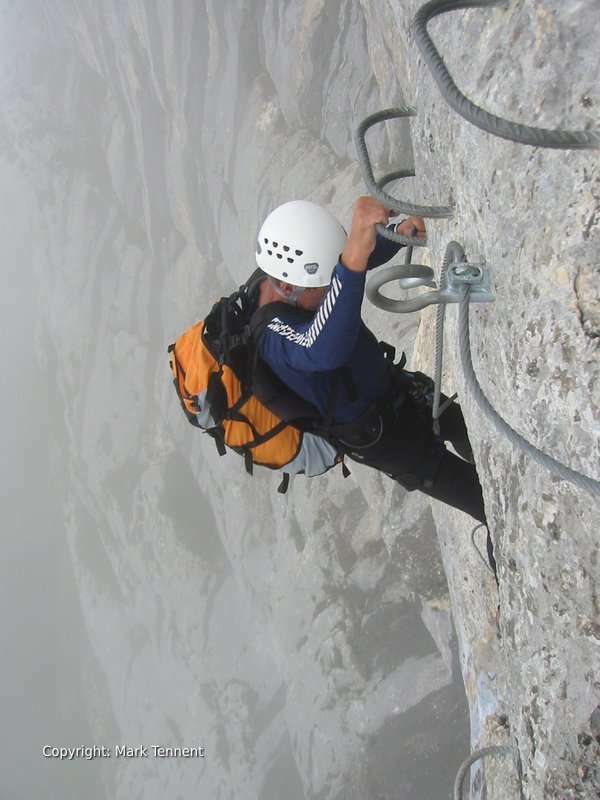 Instruction by Mark – qualified mountaineering instructor / “moniteur d’escalade”. Group transfer from Geneva airport or Albertville railway station. Drinks or other incidental expenses. Holiday Insurance including cover for mountain rescue.